In the previous part of the series we went through the various circuits that can take logic level digital signals and make them suitable for driving the gates of the bridge power FETs. These circuits range from trivial to complex, and have some interesting properties, like turn-on and –off delay or limits on duty cycle that will have implications for our current discussion. In this article we will step further back from the ‘bare metal’ of the H-bridge and concentrate on the digital control of the bridge. The discussion will concentrate on how to generate the various control signals and how to implement the different drive modes we’ve discussed before. For the most part, the detailed implementation of the driver and the bridge itself (PMOS or NMOS devices, etc.) are not a concern here, though occasionally we’ll have to take the special requirements of those parts of the design into consideration. As we’ve seen before there are many drivers and there are many ways those drivers need to be controlled as well. For both low- and high-side drivers, the two basic schemes are active low or active high control. As you can see the enable signal is active low in this example, and the PWM non-inverted. Full-bridge drivers can expose an even wider variety of control options, since they drive four FETs. Sometimes they have four control signals for each individual FETs, or would look like two independent half-bridge circuits. Other times, they combine the control signals for the ‘A’ side and ‘B’ side of the bridge into fewer control signals. When that happens (like the HIP4080A from Intersil), the driver might start to limit the control patterns and drive modes you can use the bridge with. If you recall, both the ‘A’ and the ‘B’ side have three possible states, so a full-bridge can have six possible (static) states. This needs a minimum of 3 digital control signals, so if a full-bridge driver exposes less, you should expect limitations. Yet others (the HIP4080A is a good example for that as well) combine some analog functions to help implement closed-loop control. You can find the exact control method for your chosen driver in its datasheet. To simplify the discussion in the following chapter, I will assume that the bridge driver has four independent, active-high input signals, one for each FET. If your driver needs a different type of control, you can easily convert the signals to your particular needs. Let’s first examine, what control states each of the inputs need for the various drive-modes. Notice so far how the two ‘a’-side control signals (Q1 and Q2) are always inverse of one another. Same is true for the two ‘b’-side drive signals. One would think that we could simply drive them from the same input, through a simple inverter. Unfortunately in practice that would almost always be a bad idea but we will have to come back to that a bit later. 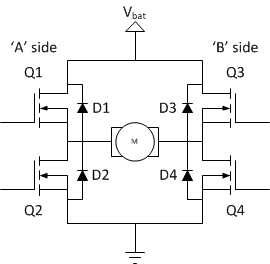 For lock anti-phase drive the ‘a’-side control is a mirror image of the ‘b’-side one. The PWM signal should be connected to both sides, but in reverse polarity. For the phase magnitude drive, two FETs are controlled with a constant signal, only one side is driven with the PWM signal. You can change driving direction by swapping which side gets the PWM drive and which one gets the static signals. For asynchronous sign-magnitude drive, only one of the four FETs is switching the other three are at constant voltages. The drive direction is changed by deciding which FET to toggle. Almost every bridge design needs to have a disabled, or power-down state. There are two possibilities to achieve that. One option is to have at least one of the motor terminals floating. The other is to short the motor terminals together. In many cases, especially when a microcontroller is in charge of generating the signals for the MOSFETs, it is important that the default power-up state of the bridge is the power-down one. This way, the firmware running on the microcontroller is in no rush of initializing the bridge control signals. It can work on getting the whole system up and running and only after all setup and initialization is done it needs to move the bridge out of power-down into the operational state. Many microcontrollers start up with their pins in a high-impedance state, when they can’t source nor sink current. If those pins are connected to the bridge driver inputs, as long as the firmware doesn’t initialize the pins for any other state, the output voltage is not well defined and the wire is susceptible to noise. This can lead to the bridge turning on or worse, getting into a shoot-through condition during startup. To prevent this from happening, its good practice to include pull-up or pull-down resistors on each bridge control pin to make sure they are at a well-defined voltage at all times. The value of the resistors usually isn’t critical as long as the don’t load the output stages inside the microcontroller too much. It is also good practice to set the resistors up such that they keep the bridge in its power-down state. We’ve mentioned shoot-through several times already in previous parts of the series. We’ve said at the very beginning that the high-side and the low-side switches of an H-bridge on the same side should never ever be turned on at the same time. If that happened, you would create a very low resistance path between your power supply and ground. There are several outcomes of such an experiment and none of them are pleasant. At best, you have some sort of short-circuit protection that trips and your circuit simply looses power. If not, a lot of current will start flowing through your circuit. This current will start heating things up and eventually something will break. It will heat up the battery (because of its internal resistance) and overheated batteries can explode. It will heat up the wires which can melt their plastic insulation. It will heat up the PCB traces, making them de-laminate or even vaporize and destroy the board. It will heat up your FETs and can destroy them as well. You don’t want any of these, so you don’t want shoot-through. Avoiding static shoot-through is fairly simple: just make sure you never close both ‘a’ or ‘b’-side FETs at the same time. The bigger problem is dynamic shoot-through: when you turn one FET off, while turning the other FET on, for a short while both the low and high-side FETs are potentially conducting to a certain degree, creating a – relatively – low resistance path for the supply to flow to ground. This results in a current-spike that – while not as destructive as static shoot-through – is still quite problematic. To prevent this, you have to delay the turn-on of the low-side FET by at least as much as the turn-off time of the high-side FET. The same goes of course for the other transition, when you switch from low-side to the high-side. This technique has many names, dead-time, shoot-through protection, no-overlap PWM, but whatever you call it, unless you know the turn-off times, you can’t time this delay properly. This is one of the reasons I’ve sent so much time in the previous installment talking about turn-on and –off-times and how to calculate and control them. When you do employ shoot-through protection however, you will end up with a different problem: now, instead of having both the low- and high-side FETs conducting for a short while during the transition, you have none of them conduct for a split-second. At the same time – as we’ve discussed several times already – the motor current cannot just stop flowing instantly, so some circuit – the catch diodes – will have to take over. As the diodes usually have a higher loss than the switches themselves, during this short time the heat dissipation of the bridge will be higher than normal. This additional dynamic loss on the bridge gets worse as your shoot-through protection window gets a larger and larger portion of the cycle time. So for really high-frequency operations, tight shoot-through protection window control is needed to minimize this source of heat dissipation. In those applications various dynamic shoot-through protection techniques are becoming more and more popular, mostly as part of the bridge driver circuitry. In many cases, integrated bridge drivers have built-in shoot-through protection circuits with fixed or programmable block-out windows. With those you only have to make sure that your turn-off times are compatible with what the parts can support. If you are using a part without such protection or are building your own driver, you’ll have to make sure that proper shoot-through protection is implemented either in HW or in SW.
where Vth is the high-level trigger voltage of the Schmitt-trigger. With many Schmitt-trigger circuits having their lower and higher threshold voltages set at 1/3 and 2/3 way between 0 and Voh, both time delays end up roughly R1 C1 and R2 C2 respectively. 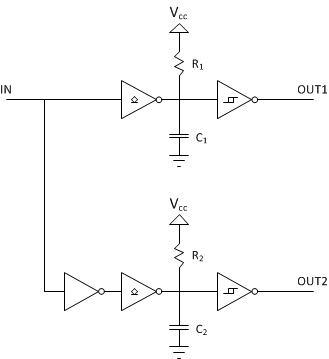 The input gate (G1) can in many cases be the output driver of the PWM output pin, especially in CMOS logic. Many bridge drivers have Schmitt-trigger input stages so if the input polarity works out the right way, the output buffers (G2, G3 and G4) can be eliminated as well. Even if not, a 6-gate Schmitt-trigger chip, like one of the many variants of the 7414 chip provides a single-chip solution (obviously the normal inverters can also be Schmitt-triggers, they just don’t have to be). You can see that depending on the drive mode, the control signal routing can be fixed or need to depend on the off-time current conduction path chosen (which can be a design-time decision). In the case of asynchronous sign-magnitude drive, the signal routing needs to be dynamic as even a drive direction change changes the PWM signal routing. This may or may not be problematic, many microcontrollers have flexible enough I/O pins that make all of the modes possible without external logic. However in many cases the support of asynchronous sign-magnitude drive requires four PWM generators inside the microcontroller, as it might not be possible to get a single PWM source appearing on multiple, configurable pins. Another interesting observation is that asynchronous sign-magnitude drive doesn’t use the \PWM signal. As a consequence it doesn’t depend on proper shoot-through protection window setting on the PWM output, so if your microcontroller doesn’t support no-overlap PWM signals and your FET driver doesn’t support shoot-through protection either, this drive mode might still be available to you. Static loss, which is simply I2Rdson times their conduction percentage per cycle for FETs, and VfI times their conduction percentage per cycle for the catch diodes. Dynamic loss, which is more complex to calculate but is related to how often the device is turned on or off and how much it spends in between the ‘on’ and ‘off’ states. Dynamic loss on the catch diodes is related to the size of the shoot-through protection window and the actual turn-on and –off times of the FETs. The average static loss between the four devices only depends on the drive mode and the duty cycle. The average dynamic loss depends on the switching frequency, the turn-on and –off times and the shoot-through protection window size. Depending on the drive mode however, the generated heat doesn’t get distributed evenly across the four FETs and diodes. This means that in sign-magnitude drive, the switching FETs will have more dynamic loss (heat) than the non-switching ones. Taking static losses into consideration as well, it’s easy to see that for example in our previous forward driving case Q3 and Q4 together will dissipate more heat than Q1. For asynchronous sign-magnitude drive, the asymmetry is even more obvious: in that case (same forward drive example) Q3 never opens, yet conducts current during the off-time through it’s body-diode. As losses on such a diode are normally higher than on the FET itself, it dissipates even more heat than in the previous case. Finally, for both types of sign-magnitude drive, there’s one FET that never conducts at all. These imbalances complicate thermal design of the bridge. It would be best if we could spread the heat more evenly across the four devices. We can do that of course mechanically, by mounting them on the same heat-sink, but there are electrical ways to make situation more balanced as well. We’ve just discussed that in lock anti-phase drive all four FETs are turned on and off in every cycle. The motor current is conducted through FETs for both the on- and off-time as well. This means that we can’t really optimize the heat-spreading in this mode: dynamic losses are equally distributed already, and static losses depend only on the conduction time of the switches, which depends on the duty cycle (d). Still, let’s examine the behavior of the bridge in this mode so we have something to compare the other options to. This is pretty much as good as it gets, with the (static) heat dissipation distributed equally among all transistors in the idle state (note that for this drive mode 50% duty cycle corresponds to idle). The further we get from the idle position the more imbalance we have between the FETs. You see that – as we’ve said before – all four devices are turned on and off during the cycle, so each sees two transients and the associated dynamic loss. As you can see each FET turns on and off exactly once through two cycles, so there are two turn-on and two turn-off events in each cycle. This is the same number as the original sign-magnitude drive, which means that the overall dynamic losses are the same. However, now the dynamic losses are evenly distributed between all four FETs. Of course a similar dual-cycle drive pattern can be constructed for the reverse direction as well. There are two down-sides to this control pattern, one fairly obvious, the other is a bit more subtle. The obvious one is that we need the ability to control the bridge differently in odd and even cycles, so we need to introduce some sort of a ‘memory’ or ‘state’ to the control circuit. If the signals are generated by HW PWM controllers inside a microcontroller, such state may or may not be possible to introduce. The less obvious complication is that with this drive mode, there’s no power-down state any more. At 0% duty cycle, the FETs are still switching, so the drive signals aren’t static. The final benefit of implementing this more combined control mode is that you can use N-channel MOSFET drivers on the high side with ease. Remember that we’ve discussed that these boot-strap configuration drivers can’t be used to continuously open the high-side FETs. With these complex control modes, all four FETs are switching so this isn’t a concern any more. The other problem with these drivers, that they can’t be used with 100% duty cycle still remains, there’s not much that can be done about that. Here, the first and second cycle uses high-side off-time conduction, the second two cycle uses the low-side. The difference between the first and the second cycle is whether Q1 or Q3 conducts. Similarly the 3rd and 4th cycles change conduction between Q2 and Q4. You can see that this pattern doesn’t equalize dynamic loss: Q1 and Q2 switches 3/2 times per cycle on average, while Q1 and Q2 only switches 1/2 times on average. This is usually not a big problem at the switching rates of the usual H-bridge. The bigger deal is that it distributes the heat that gets generated by the off-time current through the catch diodes evenly. That is in many cases the biggest source of heat in a bridge with asynchronous sign-magnitude drive. Because of that, while this control pattern obviously is even more cumbersome to generate, it is even more important to do so. Of course, just as in the previous case, we loose the inherent power-down state, so if this complex control mode is employed, the shut-down state will need to be restored by creating it externally. Finally, just as before, this more complex cycle allows the use of boot-strapped high-side N-channel drivers, which was otherwise a limiting factor in asynchronous sign-magnitude drive. In this article I’ve gone through some higher-level control problems for H-bridges. I’ve shown how to route the PWM signal and introduced some complex multi-cycle drive-patterns that spread the heat around more evenly with the four FETs and their diodes that make thermal design easier. We’ve spent some time on discussing the need for dynamic shoot-through protection and ways to implement them as well. The next installment of the series will focus on various safety features that a well designed H-bridge will have to employ. These involve protection for the bridge itself, for the load and the power supply, but also its mechanical environment. Great stuff. I’ve read through each section just now, and I’m awaiting the next!
. I have one particular question with respect to heat generation avoidance in a bridge setup with P-channel drivers for the high side. Since the Rdson for such high side switches is typically (much) higher than those of the N-Channel low side, I would assume it is in the interest of heat avoidance to maximise the off-time current looping through the low side switches (at least to have an as low as possible average static loss). That thought seems to go against the implementation of heat spreading as you have explained it. Is this correct ? Thanks for the comments. You are in fact right, I should note that in the article: the heat spreading technique I discuss only makes sense if the Rdson of the four switching elements are roughly the same. In the case of P-channel high-side switches that usually isn’t the case, so you’re better off just keeping them off as much as you can. Thanks again for the correction! I have a proprietary (made in Italy) 12vdc 10A motor controller I needed to reverse engineer as during routine operation it shorted out and no schematic was available. 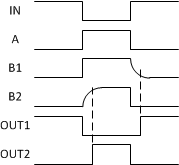 There is an H Bridge with pairs of IRF540 (N) and IRF5210 (P) and the short was in one pair on the same half bridge. Although switching is contolled by a PIC18F, there is no PWM only simple closing and opening of respective MOSFET N and P channel pair to control direction by the PIC through a hardwired hand controller with two buttons for direction selection. I was surprised there was no external catch diodes for any of the MOSFETs. This controller has been widely used by this manufacturer to control these types of motors (used to rotate heavy antenna masts) and no problems apparnetly have been reported in routine use. Now with your series of articles on H-Bridges I am learning quite a bit for a non EE hobbyist. The inductive load to the internal catch diode is around 24A but these HEXFETS internal diodes are rated for 33A continuous and 110 A pulse. I would like to improve the design to control motor speed by building a new controller using PWM and your website has been incredibly helpful in my steep learning curve. Many thanks. That circuit can provide independent control of turn-on and turn-off times by creating a different drive resistance for gate-charge and -discharge paths. It might be important if your driver has a non-symmetrical drive impedance. Hi Andreas, great job! I just read all your H-Bridge posts. This was the first message that i left to you under “Safety features”, but maybe it has been lost, so i repost it now here because that page seems to not accept messages. Here about monitoring current, what do you think about hall sensors? Hall sensors are great though a bit expensive. I’m using them in my designs because of there extremely low resistance: it’s rather easy to get MOSFETs with sub 10mOhm resistance, and so its quite easy to get most of your efficiency loss from the current-sense circuit.